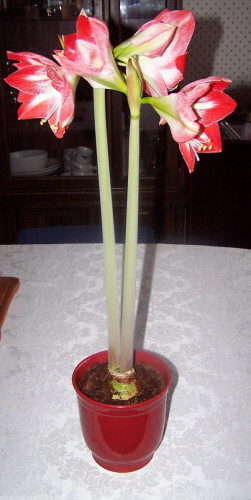 Amaryllis Bulbs are one of the easiest bulbs to force indoors. I ended up with one from a Yankee swap party last Christmas and planted it early in February to add to my collection of indoor plants. It was not long before the bulb was in full bloom. Having a splash of color indoors in the middle of winter is such a treat. (See my tips for forcing forsythia indoors here.) 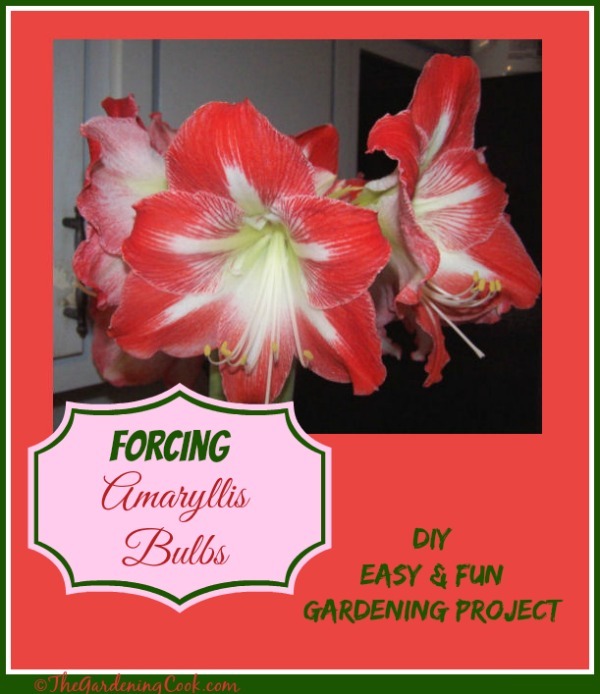 Amaryllis is also a good choice for forcing. All types of bulbs can be forced indoors. 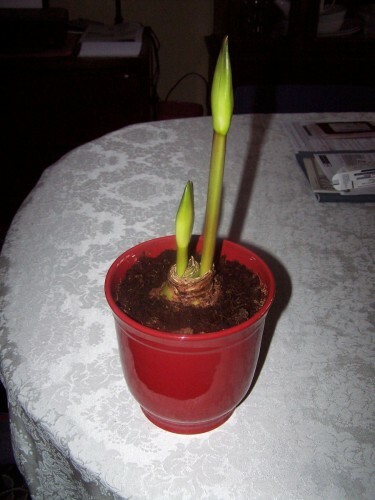 I just tried some paperwhites with good success, too. 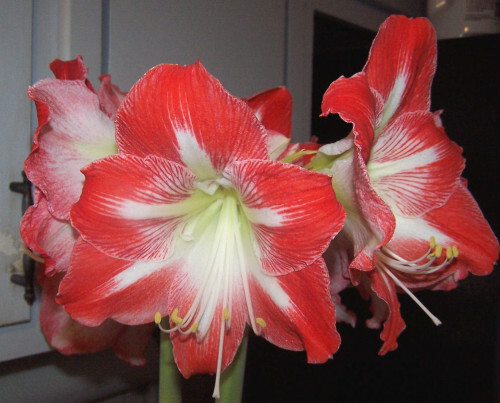 If you like to grow flowering houseplants that give you spectacular blooms in the dead of winter, forcing amaryllis bulbs is a great way to bring the outdoors into your home. 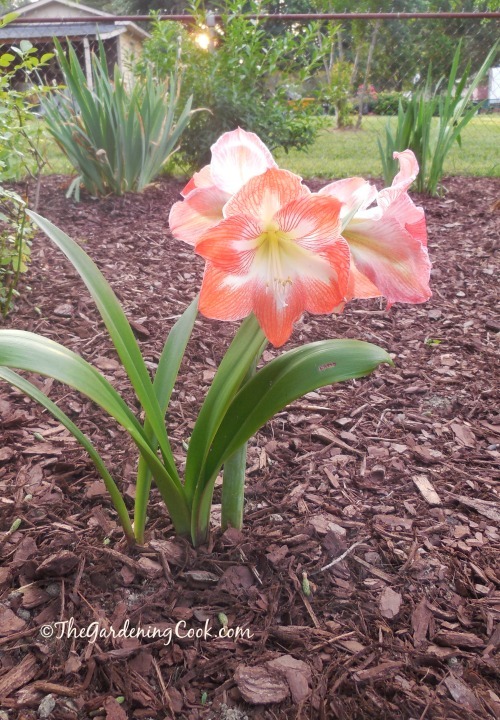 Amaryllis is considered a true member of the flower bulbs family, as compared to other corms, rhizomes and tubers. 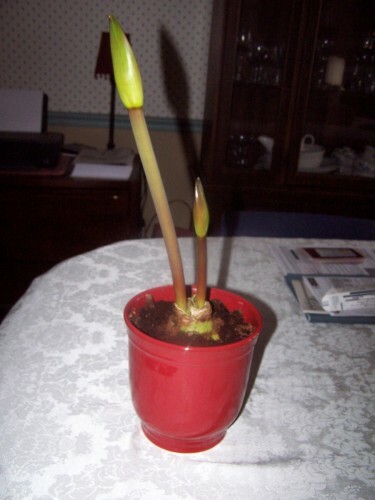 Here is a group of pictures showing the plant as it grew. There were some days it seemed to grow about 8 inches in one day! It took from February 6 to March 17 for the full effect. Growing it was so easy. All I did was plop it into a pot (this one didn’t even have drainage holes on the bottom!) 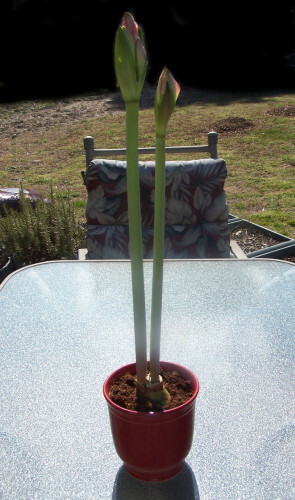 I left the very top of the bulb just slightly exposed and added potting soil. Even moisture until it started flowering, and then I kept it fairly moist. It was sitting in a south facing window. This is a perfect project to do with children. Kids are quite impatient and have a hard time waiting for their plants to grow. Not so with this bulbs. There are days that it grows a few inches a day! March 14 March 17th in all its glory! An up date on this post. After the blooms finished flowering, I took the whole thing out of the pot and planted them in my zone 7 b test garden. 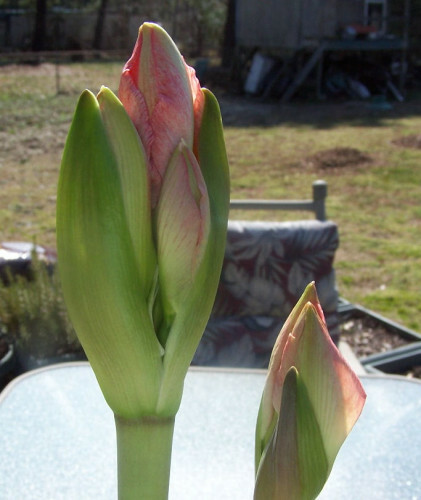 I had no real hopes that the thing would bloom outdoors after our cold and snowy winter last year. When I was tending the garden this spring, I found a plant that needed moving. I thought it was a gladiolus at first. To my delight, after three big snow storms, I discovered that it had survived the winter. 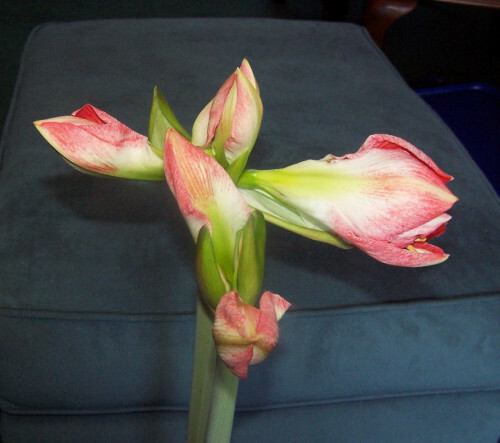 Amaryllis are tropical and normally only grow in zones 9-11. What a treat! The colors are a bit less vibrant because it is in the sun but still a glorious plant. Hopefully, it will continue to survive the winters here and multiply. Wouldn’t that be wonderful? I would add a support for such heavy bloom. Hi Bob, Yes, I had to do that in the end. Thanks for adding the tip!